This book is just fantastic! It kept me up late three nights in a row and I was so engrossed in the story that I was there in the room with the characters, right from the start. If you like your crime fiction to be full of tension and action, then this book is for you. It also has a very neat little twist at the end that had me smiling. A truly perfect book for this time of year, when the nights start early and you need something to transport you away from yourself. Ryan Drake is a Brit, and former soldier, who works for the CIA. He spends his working life searching for people - most of whom have defected from the CIA - and bringing them home for 'debriefing'. He is good at what he does and, despite leaving the army under a cloud, has worked his way up the ladder and is now a team leader. 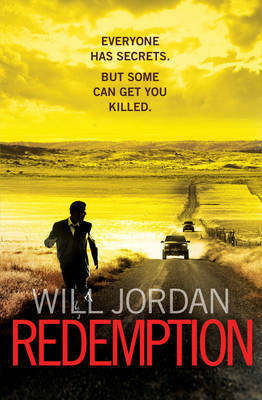 In REDEMPTION, Drake is called into the office early one Sunday morning, dragged from his morning run and with a stinking hangover, to be given a mission so dangerous as to be nearly impossible: he has to rescue a former agent, code-named Maras, from incarceration in a high security Russian prison and has three days to do it. Tempted by the promise of his name being cleated if he succeeds, Drake gathers his team around him and they put their plan together. To everyone's surprise, including his own, Drake gets Maras out of prison but is then put on the spot by the kidnapping of his sister and ends up on the run with Maras, a woman trained to kill with her bare hands and that trusts no-one after her years in jail, in order to save his family, as well as himself. Jordan has done an excellent job to keep the mood and tempo of this book on a knife's edge without making it into a cheesy light read. It is exciting and well-written. Be prepared to find yourself totally engrossed in it.